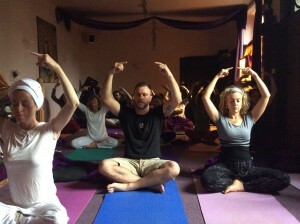 “What brings me back each week to this inspirational Kundalini yoga class (now for over 3 years)? It is the commitment, pleasure,empowerment, joy and love from our teacher, Preet. I have found deeper peace, and connection as well as physical fitness and core strength. Fantastic! Thank you so much for all you have given and shared. ” Nicki. This class will taught by Preet and Puran Udini. We have years of experience in teaching yoga and we look forward to sharing this transforming yoga with you. Please contact Preet Kaur with any queries.